In your iOS app, the users have options to either register or buy PPV content through Apple’s In-App Purchase or they can register or buy PPV content through your website and then login to your iOS app to watch the content. In-app purchases are extra content or subscriptions that you can buy in apps on your iOS devices. When your users register, or buy any PPV content through this method, Apple will deduct 30% of the payment made by your users and will give you the rest 70%. Note: Once your app becomes a year old in the iTunes App Store with in-app purchase option, Apple will reduce the revenue share percentage from 30% to 15%. If you want your users to avoid Apple’s In-App Purchase method then, you can ask your users to register or buy any PPV content through your website. Later they can watch the content in your iOS app by simply logging in to your app. Here they don’t have to register or buy PPV content through Apple’s in-App purchase and you will get the full amount that users pay for the registration or for buying any PPV content. Note: However, you need take care of few things if you opt for the second option (i.e. Ask your users to register through your website and then login to iOS app to watch video). If you don’t follow these guidelines then Apple will not allow you to publish your iOS app in the iTunes store. Please remove the account registration feature from the iOS app. If your iOS app includes any fully-qualified links to your site that could indirectly provide access to account registration process, please be sure to also remove them. Remove password retrieval links and any other fully qualified links that could indirectly provide access to these mechanisms, such as links to web pages for support, FAQ, product or program details, etc. Many reputed companies are following this approach to avoid in-app purchase and save their money. 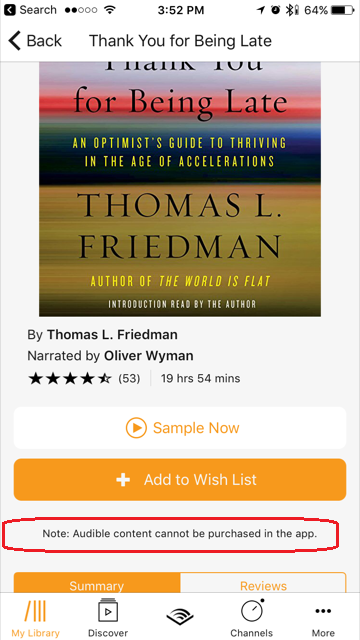 Please check the below screenshot of "Audible".